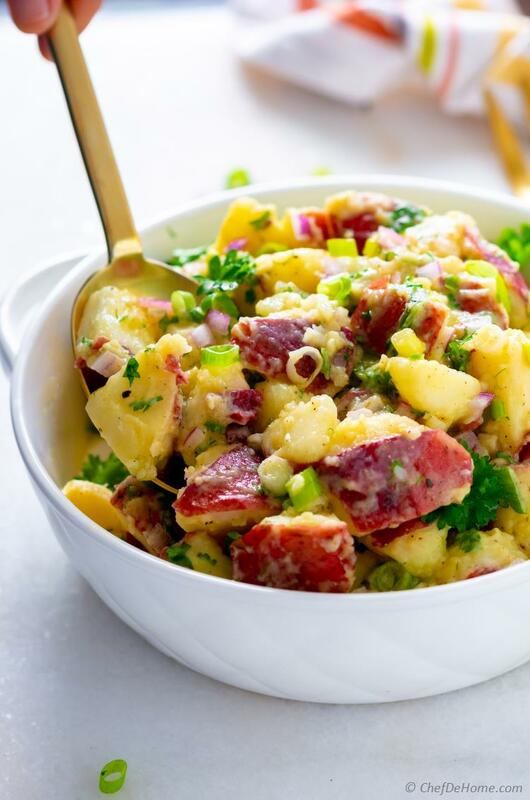 Sweet and Sour Southern German Potato Salad with delicious Mustard Vinaigrette dressing. Serve cold or at room temp, it is perfect all-season Potato Salad. 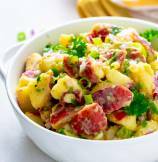 German Potato Salad is a sweet and sour Potato Salad flavored with chicken stock, onion, herbs, and tangy Mustard Vinaigrette dressing. Gluten free, dairy free and all-season Potato Salad which can be served cold or at room temperature. 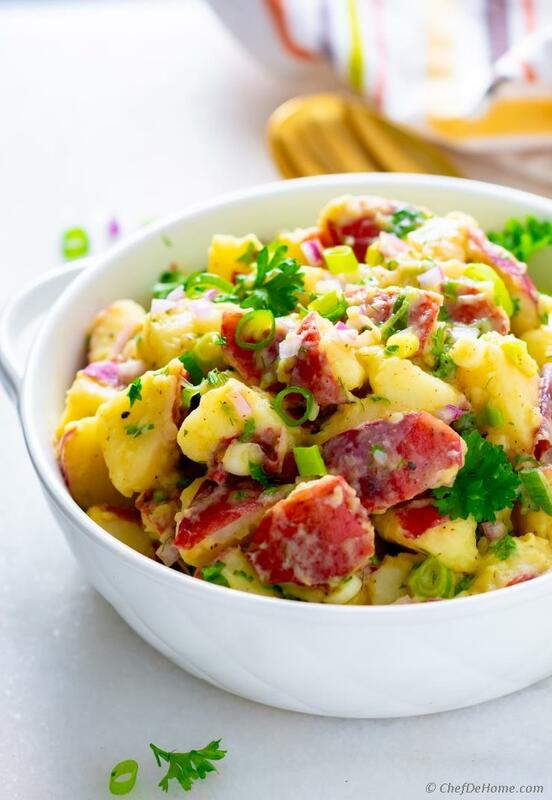 Also known as Kartoffelsalat, this Southern German Potato Salad is made flavorful with special cooking-hack... That is, hot boiled potatoes soaked into mixture of warm chicken stock and wine. Hot boiled potatoes soak-in chicken flavor. Next, the refreshing sweet and tangy Mustard dressing adds delicious savory bite. I love it because 1) it is not a heavy potato salad, 2) has no mayo, 3) and can be served cold or at room temperature. So, let's try some German Potato Salad! Potato Salad are mostly known as creamy, mayo-laden salads. But, I always look for ways to make potato salad delicious without mayo. Earlier on blog, I have also shared a Creamy Potato Salad without mayo. And this delicious Chickpea Potato Salad with Indian Spices but no mayo. When one of my follower requested recipe for German Potato Salad... I was so happy to make it because it is my kind-a salad. Lite, with sweet and sour dressing, and no mayo. Two main kind of potato salads are made in Germany. Northern version has base of mayo. Southern, also known as Kartoffelsalat, has chicken stock, mustard, oil, and vinegar as main ingredients. 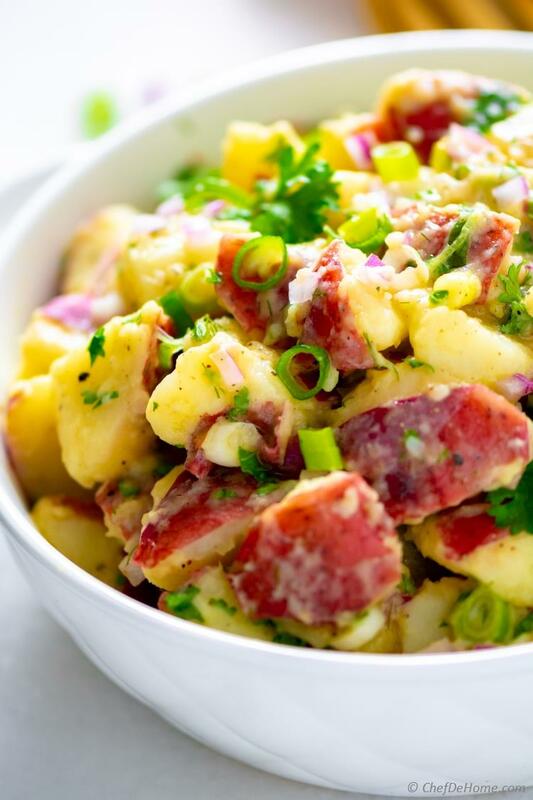 Kartoffelsalat, Southern German Potato Salad, is most common kind of German Potato Salad known in U.S. This is the one I'm sharing today. 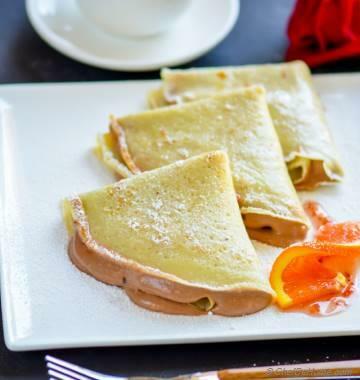 It has signature flavor of broth, mustard, oil and vinegar, is dairy free, and is creamy with own starch of potatoes. For more color and crunch, I also like to use two kind of onion in this salad : red onion instead of yellow (for color) and green onion (scallion). The flavor of broth, potatoes and mustard dressing really benefit from addition of onions. I highly recommend trying salad with both : red and green onion. Like I mentioned, German Potato Salad is not seasonal. 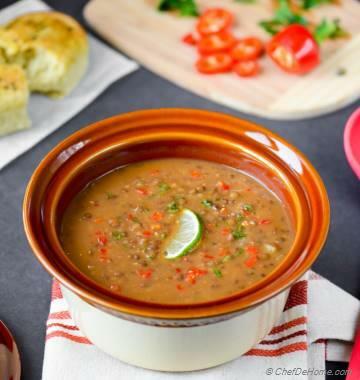 It is can be served at room temperature, cold, or even warm. So, it is a good salad to serve as hearty dinner side all year round. In summer BBQ, spring potlucks, or winter chicken roast dinner. Hey Guys! Oktoberfest is going on (September 22 - Oct 7). If you planning an Oktoberfest Theme-Party, it will even fit perfectly in. After all, it is German Potato Salad! Speaking of Oktoberfest reminds me.. Have you tried my Homemade Soft Pretzels with Beer Cheese Dip? No Oktoberfest without beer and pretzels! To make German Potato Salad (Kartoffelsalat), I start by boiling the red potatoes until fork tender but not mushy. Leaving skin on potatoes add good color and texture to the salad. But if you are not okay with skin, feel free to peel it off. Next, I mix hot boiled potatoes with hot chicken broth and wine mixture. Potatoes absorb stock and wine mixture becoming very flavorful. While potatoes enjoy stock bath, I make dressing with oil, vinegar, mustard, and sugar. Mustard is the main flavor of salad. If you can get German Mustard, even better. 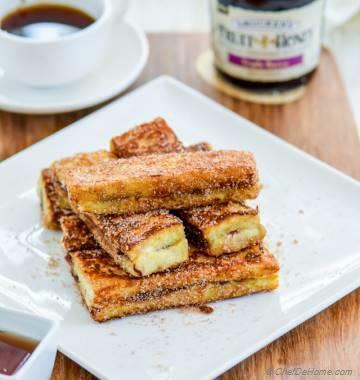 The sweetness of sugar is very important to balance the tang of mustard, wine, and vinegar. so, please don't skip sugar. 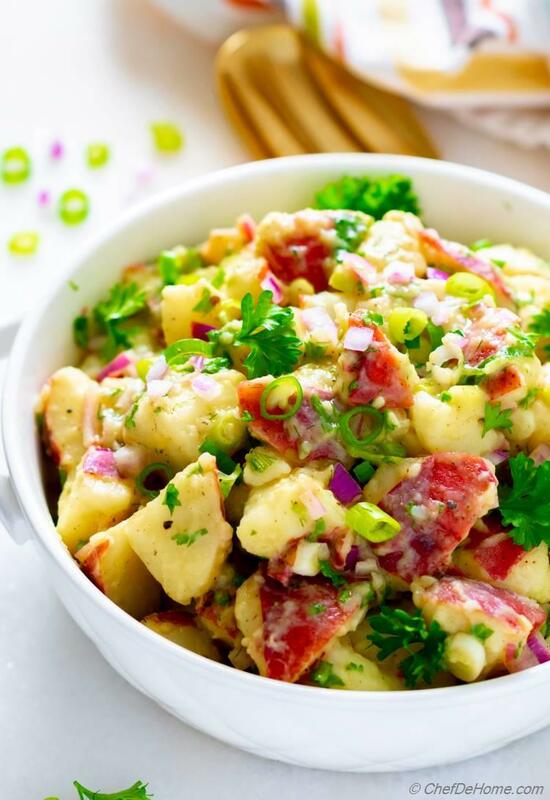 A quick mix of red onion, green onion, herbs - dill and parsley and German Potato Salad is ready to enjoy! I don't cool off potatoes fully but still lukewarm when mixed with dressing. In my humble opinion, this helps dressing absorb better in potatoes. Remember to always adjust salt to taste. Serve and enjoy! I hope you enjoy eating this Potato Salad as mush as I enjoyed creating it for you. 1. Dice red potatoes to bite-size (about 1 inch) pieces. Don't peel skin. Add potatoes to pot with enough water to cover the potatoes. Boil water with potatoes for about 15-17 minutes or until potatoes are cooked but still firm (not mushy). Drain. Add to a wide serving bowl. Set aside. 2. Microwave chicken stock in microwave safe container until hot, about 1-2 minute. (handle carefully). Mix in white wine. Pour stock-wine mixture over potatoes. Mix and set aside to cool a bit. In this time, potatoes absorb stock making'em flavorful. 3. In a bowl, add vinegar, olive oil, mustard, sugar, salt and black pepper. Whisk to emulsify mustard with oil and vinegar. Make sure sugar is fully dissolved. 4. Pour dressing over potatoes with chopped green onion, red onion, and half of fresh herbs. Toss to coat potatoes in dressing and herbs. Taste and adjust salt. Garnish with remaining herbs. Serve and enjoy! *Mustard is the main flavor of salad. If you can get German Mustard, even better. **Sugar The sweetness of sugar is very important to balance the tang of mustard, wine, and vinegar. So, please don't skip sugar. Always adjust per taste. This looks very good. Cant wait to try! thanks for posting, Savita! Highly appreciated.